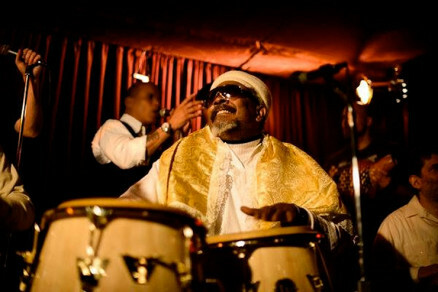 Master percussionist, scholar, and composer Román Díaz is a living repository of Afro-Cuban music. This special performance features his all-star Afro-Cuban Music Ensemble, along with special guests from the Oyu Oro dance company. The artists will premiere Ibú – Ngoma, a selection of the diverse folkloric traditions inherited in Cuba from West Africa and the Caribbean, highlighting lineages from the Congo, Abakuá, and Haiti. Díaz has performed and recorded with a “who’s who” of Cuban artists and jazz masters, including Paquito D’Rivera, Wynton Marsalis, and Pancho Quinto. As a member of the ensemble Yoruba Andabo, he helped create the sound that has defined Cuban rumba since the 1980s. His mastery of Batá drumming, along with his rock solid groove on congas, is present on countless recordings worldwide.